Here is Ephron in all her contradictions, warm and cold, embracing and distancing, funny and severe, revealing about almost everything in her life, except that she was dying. 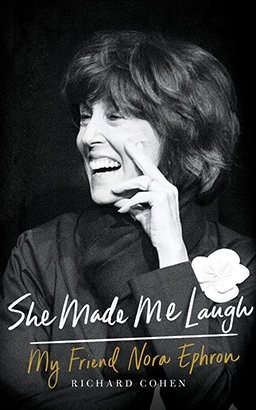 This is a frank and loving account, her life and times captured by her longtime and dear friend in a blunt, hilarious, raucous, poignant, and tender recollection. Nora Ephron was a phenomenal person, mother, wife, sister, journalist, essayist, novelist, playwright, Oscar-nominated screenwriter, and movie director (When Harry Met Sally . . .; Sleepless in Seattle; You've Got Mail; Heartburn; Julie & Julia). She wrote a slew of bestsellers (I Feel Bad About My Neck>; Heartburn; I Remember Nothing; Scribble, Scribble; Crazy Salad). She was celebrated by Hollywood, embraced by literary New York, and adored by legions of fans throughout the world and loved deeply by her throngs of friends. "I call this book a third-person memoir," Richard Cohen says. "It is about my closest friend and the lives we lived together and how her life got to be bigger and bigger until, finally, she wrote her last work, the play Lucky Guy, about a newspaper columnist dying of cancer while she herself was dying. I have interviewed many of her other friends-Mike Nichols, Tom Hanks, Steven Spielberg, Meryl Streep, Arianna Huffington (as well as her hairstylist)- but the book is not a name-dropping star turn. I want to capture this remarkable woman who meant so much to so many people, women in particular. She did always make me laugh."